In the nucleus of every cell in your body are 23 pairs of chromosomes, one from each of your parents. These pairs of chromosomes contain genetic material that determines your development, such as the color of your eyes and hair. Sometimes, chromosome 21 gets an extra copy. When this happens, a child is born with Down syndrome. Every child is different, but most children born with Down syndrome have some obvious physical characteristics. Their eyes might slant upward and they might be small. They might have a deep crease across the palms of their hands. Children with Down syndrome often have developmental delays. It might be harder for them to learn to walk and talk. They might need extra help learning to dress themselves or use the bathroom. Down syndrome was often mentioned in art, literature, and music, but it wasn’t until 1866 that it had a scientific definition and name. A doctor, John Langdon Down, first described it in a published article. 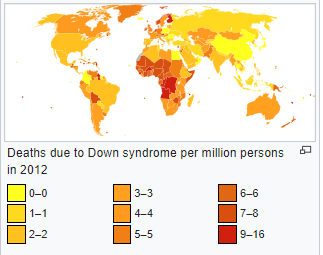 Down syndrome is the most common genetic disorder. About 1 in 700 babies in the U.S. have Down syndrome, or about 6,000 every year. Older women are more likely to have a baby with Down syndrome. Very rarely, the condition runs in a family. During pregnancy, women can opt to go through tests to determine if their baby has Down syndrome. After birth, a doctor might notice physical symptoms that might indicate Down syndrome. Genetic tests can confirm the diagnosis. One hundred years ago, a child with Down syndrome might live to be only nine. Today, people with Down syndrome are living longer and are enjoying healthier, happier lives. Question: A child in my class has Down syndrome. How should I treat her? Answer: Just like you would anyone else. Children with Down syndrome like to play sports and games, paint, play music, and have friends just like everyone else. She might need extra time to learn new things or do her school work. Be patient. Offer to help her. Sit with her at lunch and invite her to playdates and birthday parties. Don’t ever call a child with Down syndrome retarded, which is very hurtful. Watch a video about Down Syndrome. Declan, Tobin. " Down Syndrome facts for Children ." Easy Science for Kids, Apr 2019. Web. 18 Apr 2019. < https://easyscienceforkids.com/down-syndrome/ >.